Georgia’s youth opposition group is launching a “pursuit campaign” against President Mikhail Saakashvili. Starting on March 17th, they pledge to spoil the president’s leisure time. 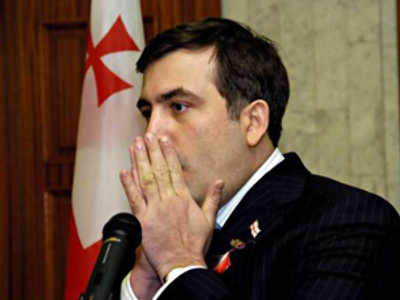 According to the «7th November» opposition group, the activists won’t let Saakashvili have any fun. “We will hold loud rallies everywhere Saakashvili appears, and we will do this around the clock”, leader Dzhaba Dzhishkariani told Russia’s Interfax news agency. On March 9th, the group’s activists spoiled the president’s dinner at one of Tbilisi’s Japanese restaurants by protesting in front of the building. A hundred policemen had to disperse the crowd. Witnesses say the president uses this restaurant every week. Political strains have again resurfaced in Georgia in the past few months with many opposition parties demanding Saakashvili’s resignation. Several of his former allies also joined in line to demand early elections. 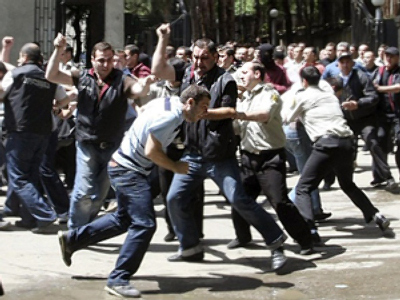 Among them were former state minister Georgi Khaindrava, Georgia’s former UN ambassador Irakly Alasaniya and parliamentary speaker Nino Burdzhanadze. The opposition plans to start protests on 9th April. 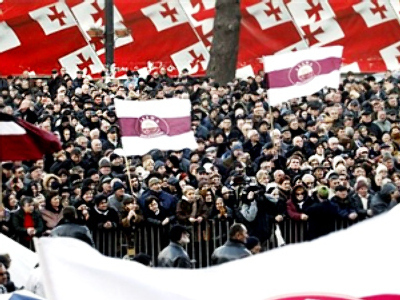 Earlier this month they held an anti-Saakashvili concert and march. One popular singer, whose brother is an opposition leader, performed in a cage symbolising what Saakashvili's opponents say is the prison he has created for the people of Georgia.